There are some truly spectacular towns in the Alpujarras in Granada. Take a look at all of them and get lost in the magnificence of the province of Granada. The Alpujarras is a 70 km-long valley located at the foot of the Sierra Nevada, whose name comes from the Arab al-bugscharra, which means “land of grass” or “land of pasture”. The Alpujarras find themselves between the provinces of Granada and Almeria, thus providing them with scenic landscapes, dotted with Berber-style white towns that connect to one another through hiking routes and paths. These will allow you to discover the Alpujarras completely on foot, especially in spring and autumn, when the colours of nature are far from plain. The high number of paths and routes will keep you engaged, in a broad Alpujarras discovery that will leave you breathless. Noteworthy features related to the Berbers’ legacy bless the towns in the Alpujarras in Granada, which you can distinguish in the whitewashed walls of the homes, the flat roofs and their location on the side of hills and mountains. These characteristics have drawn the attention of writers and artists along the centuries, such as that of the British author Chris Stewart, who relates his adventures in Driving Over Lemons. Take a look at some of the most famous towns in the Alpujarras in Granada and the ones on which you can’t miss out. The town of Lanjarón is famous for the water, both the thermal one, which allows wellness tourism to be one of the main activities related to Lanjarón, or the nationwide known mineral water that carries the same name. 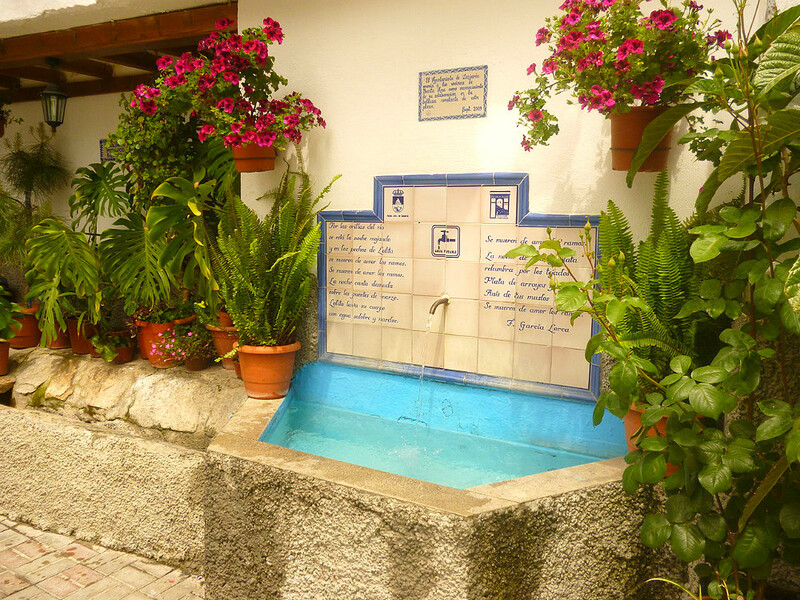 Lanjarón is the closest Alpujarran town to Granada (49km), and it welcomes its visitors with a Water Museum (how not!) and lots and lots of shops selling the delicious Jamón de Lanjarón, runner-up in the competition of the best hams of the Alpujarras (Trévelez won the first prize). You can reach the town of Lanjarón either by car or by bus. If you like driving, take the A-44/E902 from Granada. Or else, jump on the first ALSA bus that leaves from Granada for a little more than €4. Órgiva is the most populated town of the Alpujarras in Granada, as well as the capital of the western part of this region. 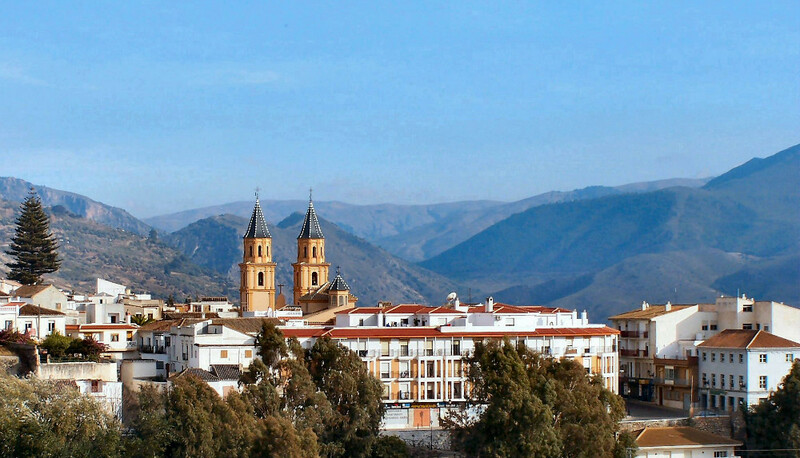 Located in the Natural Park of Sierra Nevada, it is easily recognisable thanks to the 16th-century twin towers of the church of Nuestra Señora de la Expectación, which you can spot from different parts of the town. It is the heart of the Western Alpujarras since it is crossed by the four main roads that connect Granada with the Costa Tropical, and with the other white towns of the Alpujarras. You can reach the town by car (A-348 from Lanjarón) or by the ALSA buses. Together with the small towns of Capileira and Bubión, Pampaneira is the most picturesque white town of the Alpujarras. It is located on the Barranco del Río Poqueira, a gorge on the northeast of Orgiva, and its name comes from the Latin word pampinarius, which has been interpreted as “vineyard”, referring to the ancient presence of this kind of cultivation in the area. Don’t let its dimensions and population, roughly 340 inhabitants, deceive you. 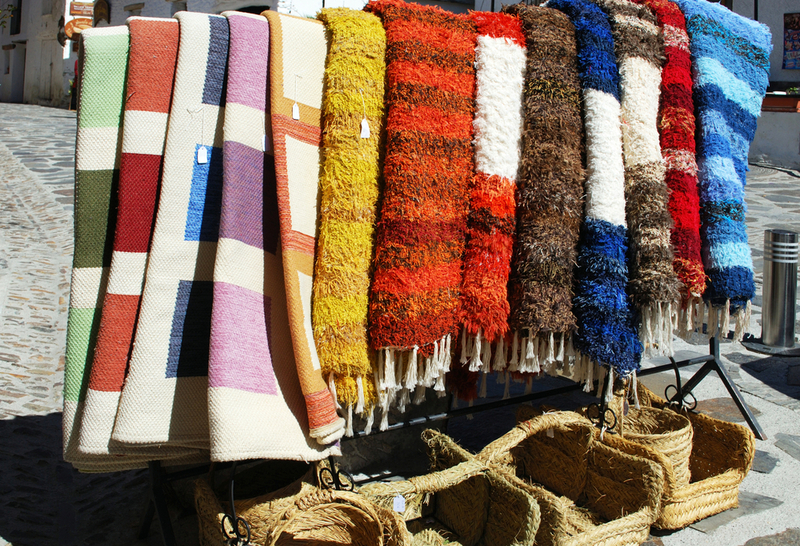 In fact, Pampaneira prospers thanks to the tourists that come here to admire the craft shops, the narrow white streets, its lively main square and some of the Alpujarras’s most beautiful rugs. Likewise, don’t miss out on the legendary Fuente de San Antonio, located near the church of the town. If you are looking for a partner, you should drink from its waters, and wait for the miracle to happen! You can get to Pampaneira through the N323 from Granada towards Lanjarón, and from Motril, towards Órgiva. Next, take the A-720 and turn left on the small roundabout located right before the entrance to Órgiva. Since the town is located 1058 mt above sea level, the roads are characterised by numerous bends. Just like its sister town, Capileira and Bubión own their names to two Latin words: capillaria, which means “head of hair”, and bovium, meaning “place of oxes”. In particular, the name of Capileira refers to the location of the town, on the highest point of the gorge, which provides the village with some breathtaking views thanks to the many viewpoints disseminated all over Capileira. Countless paths and trails characterise these two towns, where hiking lovers will never get tired. Bubión is a real heaven for those who are attracted by anything related to history. In fact, here you can find traces of the Roman and Moorish civilisations. The town of Capileira relies on a bus service used by tourists to visit the Mulhacén. This service, called Servicio de Interpretación de Altas Cumbres, also serves as Tourist Information Point and it is open from spring to autumn. It is in Calle Barranco de Poqueira, and it opens from 11 am to 2 pm and from 5.30 pm to 8 pm. Pitres is part of the small region of La Tahá, located 80 km far from Granada, together with a few smaller villages. Spot the Moorish influence that characterises the whole town, on the church tower, built on the ancient Mosque. It is very appealing also to those who love craftworks since the village is famous for the handmade tiles produced here. 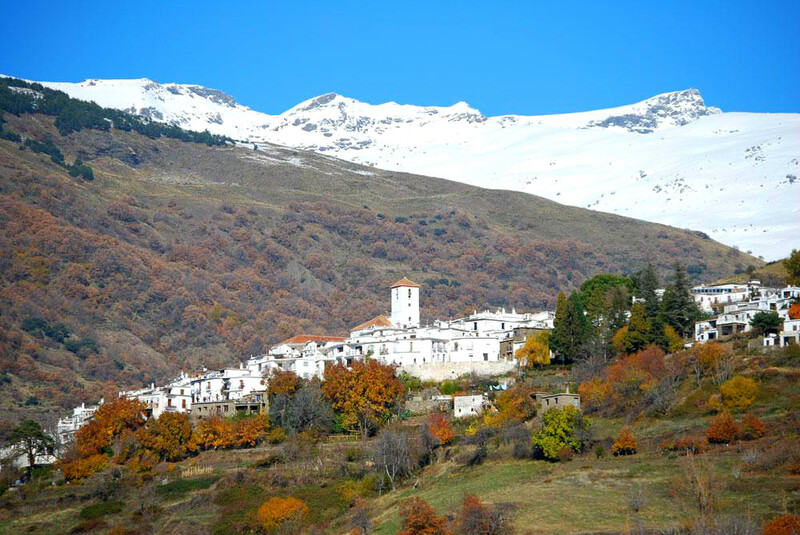 Trevélez claims to be Spain’s highest town since it is located 1476 metres above sea level. It is considered the best producer of DOP jamón serrano of the Alpujarras, and along its streets, you will come across plenty of ham and souvenir shops. From the town, you can also engage in many hiking routes that lead to the highest points of Sierra Nevada. It comprises the Barrio Bajo (low neighbourhood), the most touristic part, the Barrio Medio (medium district), characterised by the familiar sounds of donkeys clip-clopping on the streets, and the Barrio Alto (high neighbourhood), where you can discover the history of the town. The awe-inspiring towns in the Alpujarras in Granada deserve a careful discovery, not to mention their closeness to the Sierra Nevada National Park! To enjoy your holidays in this region of Andalucia at best, you may want to take a look at the best accommodations. Check some truly spectacular holiday homes and villas in the Alpujarras in Granada; you will surely find one that fits your desires at best! BOOK A HOLIDAY HOME IN THE ALPUJARRAS! The white towns in the Alpujarras in Granada are a must-see of the region. Have you ever been to any town among the mentioned ones? Which one are you looking forward to visiting? Tell us in the comments! I am so grateful I found your post, you are inspiring me for traveling. You’ve really covered up almost all the possible tips that a beginner should follow while traveling. My husband and I have been thinking of going on traveling soon. 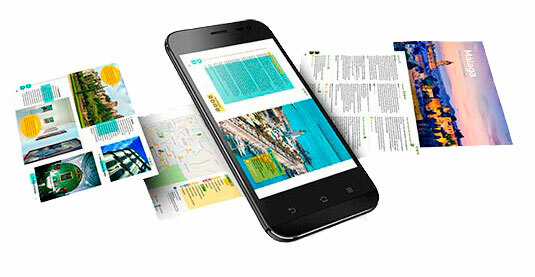 Actually, I got a lot of information from your blog which can help our trip much more relaxing and enjoyable. Thanks.